Simply, chalk one up for the good guys. Yeah, Kerry would say that. It all comes down to fear-mongering. That’s it. 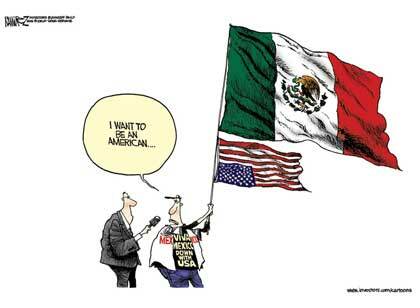 And should we feel comfortable when something as controversial as amnesty becomes greatly bi-partisan? Of course not. When a few senators secretly scheme behind closed doors in order to concoct something as dangerous and damaging as was this immigration reform bill, then personally attack those who are against it while rigorously rushing to move it through the legislative process as quickly as possible, shoving it down our throats, we should suspect that perhaps something else could be cooking behind the scenes. Regardless, thanks to millions of Americans who actually care for the sovereignty of their country by committed pestering of their elected officials, this bill will not go through, and Bush’s arrogant statement, “I’ll see you at the signing ceremony” will not come to pass. His legacy is dead. Thank God. WASHINGTON (AP) – The Senate drove a stake Thursday through President Bush’s plan to legalize millions of unlawful immigrants, likely postponing major action on immigration until after the 2008 elections. The bill’s supporters fell 14 votes short of the 60 needed to limit debate and clear the way for final passage of the legislation, which critics assailed as offering amnesty to illegal immigrants. The vote was 46 to 53 in favor of limiting the debate. Senators in both parties said the issue is so volatile that Congress is highly unlikely to revisit it this fall or next year, when the presidential election will increasingly dominate American politics. A similar effort collapsed in the Congress last year, and the House has not bothered with an immigration bill this year, awaiting Senate action. The vote was a stinging setback for Bush, who advocated the bill as an imperfect but necessary fix of current immigration practices in which many illegal immigrants use forged documents or lapsed visas to live and work in the United States. It was a victory for Republican conservatives who strongly criticized the bill’s provisions that would have established pathways to lawful status for many of the estimated 12 million illegal immigrants. They were aided by talk radio and TV hosts who repeatedly attacked the bill and urged listeners to flood Congress with calls, faxes and e-mails. Voting to allow the bill to proceed by ending debate were 33 Democrats, 12 Republicans and independent Joe Lieberman, Conn. Voting to block the bill by not limiting debate were 37 Republicans, 15 Democrats and independent Bernard Sanders, Vt. Tim Johnson, D-S.C., did not vote. The bill would have toughened border security and instituted a new system for weeding out illegal immigrants from workplaces. It would have created a new guest worker program and allowed millions of illegal immigrants to obtain legal status if they briefly returned home. Bush, making a last-ditch bid to salvage the bill, called senators early Thursday morning to urge their support. Homeland Security Secretary Michael Chertoff and Commerce Secretary Carlos Gutierrez approached senators as they entered and left the chamber shortly before the vote. “We have been in contact with members of Congress over the past couple of days and the president has made it clear that this is important to him,” White House spokesman Tony Snow said before the vote. But conservatives from Bush’s own party led the opposition. They repeatedly said the government must secure the borders before allowing millions of illegal aliens a path to legal status. “Americans feel that they are losing their country … to a government that has seemed to not have the competence or the ability to carry out the things that it says it will do,” said Sen. Bob Corker, R-Tenn.
Sen. Elizabeth H. Dole, R-N.C., said many Americans “don’t have confidence” that borders, especially with Mexico, will be significantly tightened. “It’s not just promises but proof that the American people want,” Dole said. But the bill’s backers said border security and accommodations to illegal immigrants must go hand in hand. From the beginning, the bill’s most forceful opponents were southern Republicans. GOP Sens. David Vitter of Louisiana, Jim DeMint of South Carolina and Jeff Sessions of Alabama led the charge, often backed by Texan John Cornyn. Two southern Republicans—Lindsey Graham, S.C., and Mel Martinez, Fla., who was born in Cuba—supported it. Also crucial to the bill’s demise was opposition from three Democrats recently elected from GOP-leaning states. They were Jon Tester of Montana, Claire McCaskill of Missouri and Jim Webb of Virginia. Thank you for your demand. Unfortunately for you, it isn’t happening.